Registration for couples (individual and spouse). Includes continental breakfast, lunch and one (1) copy of "Don't We Already Do Inclusion?" by Paula Kluth. DSAF of Nebraska member price. Registration fee includes continental breakfast, lunch and a copy of "Don't We Already Do Inclusion?" by Paula Kluth. Registration includes a continental breakfast, lunch and a copy of "Don't We Already Do Inclusion?" by Paula Kluth. Student price. Registration fee includes continental breakfast and lunch. 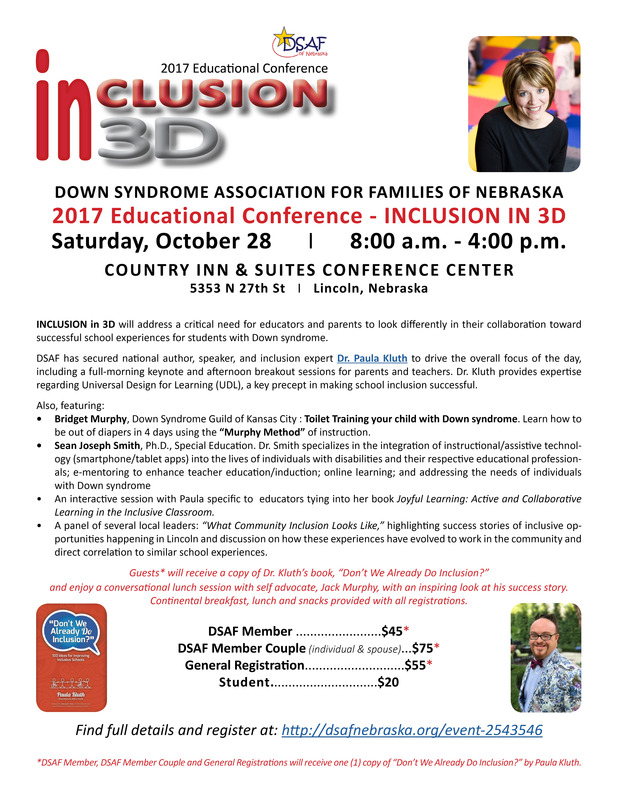 See, 2017 Educational Conference INCLUSION IN 3D brochure, for complete details and agenda! Staying overnight? Click here to access booking information for the DSAF hotel room block.